In Next-Best-Action Marketing (NBAM), Proposition Management, Proposition Data, deleting an EditList entry causes the EditList to revert to its original state as defined by the data table. Related to this issue is the fact that there is currently no intuitive way to reorder the entries on the NBAM Proposition EditList. This article suggests approaches for addressing these issues until the product is enhanced in a future release. After you create a new Proposition on Pega 7.1.3 with NBAM 7.11 and update the field labels in the EditList for the proposition, the changes are reflected in the Proposition data table as expected. However, when you try to delete the EditList entries, the changes are lost in the data table even after you check in the EditList record. This is unexpected behavior. This problem occurs only when you delete EditList entries, not when you update or rename EditList entries. The Tracer detects no errors during EditList entry deletions, updates, or during EditList check-in. The EditList record reverts back to its original state even though it was saved and checked in after your last editing session. The issue does not occur with Pega 7.1.x Data Tables. Business properties form an integral part of NBAM offers and propositions. By design, the Proposition data table first looks for the properties associated with the class. If you try to delete properties from the Proposition Management landing page, the system warns you and prevents this action in this context. This is why you cannot directly delete entries in the PropositionEditList. When you open the NBAM Proposition from the Proposition Management landing page, the system checks for all the properties created in the corresponding class and displays the list. Therefore, if you delete an entry in the EditList, your changes are overridden. In the NBAM Proposition EditList, you can modify field labels, but you cannot delete or reorder fields. Make the Proposition name (pyName) and BasePropensity the first two columns because they are integral to making the next-best-action decision. Leave the remaining fields alphabetically ordered. Make sure that the number of properties in the Proposition class matches the number of entries in the EditList. Reorder the fields in the EditList by changing both the list item and the field label. Adopt this best practice until the EditList is enhanced to be a repeating grid with drag-and-drop capability. Delete the property from the Proposition class. This deletes the column and the property value. Delete the pyDecisioningItem field from the History tab of the Proposition class to hide the column, and then add a custom field. The following example screens show the progression of actions using the custom field example zzzzpyDecisioningItem. Open the Class, go to the Hi​story tab, and click Update. 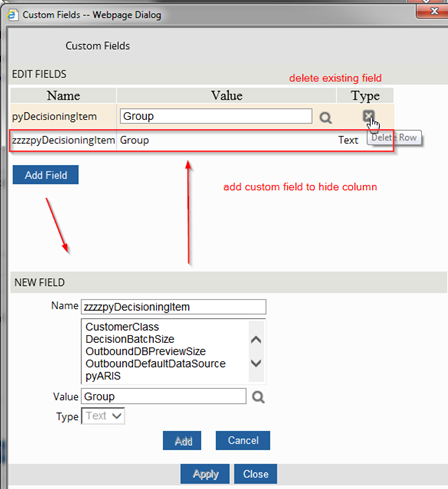 Remove the standard field pyDecisionItem and add a custom field, zzzzpyDecisionItem.